BOSTON (AP) — Alfredo Aceves only got another chance to start for the Boston Red Sox because Clay Buchholz woke up feeling soreness in his shoulder. Aceves (2-1) held the Phillies to one run over six innings in his best outing of the year, and the Boston Red Soxbeat the Philadelphia Phillies 9-3 on Monday night. Cloyd allowed three runs in the first inning and was charged with three more in the third. He lasted just 2 1-3 innings, giving up nine hits and a walk while striking out two. The Phillies made their first visit to Fenway since 2010, bringing along closer Jonathan Papelbon for his first trip to Boston since he left the team that he helped win the 2007 World Series. The Red Sox played a video on the scoreboard with highlights of Papelbon’s career in Boston, but with the outcome long-decided by the ninth inning he did not get into the game. 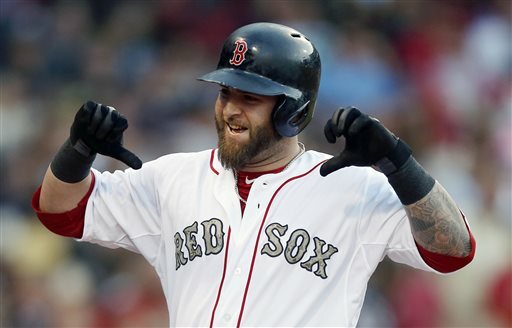 Instead, the Red Sox largely put it out of reach early, getting Pedroia’s two-run homer that also curled around the foul pole in short right field followed one out later by Napoli’s long drive that cleared the Red Sox bullpen in right field by a dozen rows. Boston made it 6-1 in the third. David Ortiz and Napoli doubled to lead off the inning, Stephen Drew singled in another run and, one out later, Saltalamacchia singled. With two outs, Jacoby Ellsbury doubled past a diving Revere in center field to score one run but Saltalamacchia was thrown out at the plate to end the inning. NOTES: Ellsbury, who hit a double to end Sunday’s game, singled in the first and doubled in the second and third, giving him hits in four consecutive innings. … Revere crashed into an unpadded part of the wall while catching Ortiz’s deep drive to end the fourth. He stayed down and the trainer ran out to help him, but he remained in the game and singled in the top of the fifth. … Cloyd had allowed three runs or fewer in six of his eight career starts, including all five on the road, before Monday. … Daniel Nava was the only player in theRed Sox starting lineup who did not get a hit. … The teams wore special camouflage uniforms and caps in honor of Memorial Day.